» $15 off $50 at Whole Foods Opening Day! Home » Capital Region Deals » $15 off $50 at Whole Foods Opening Day! $15 off $50 at Whole Foods Opening Day! Did you get the special coupon in today’s Whole Foods e-newsletter? If not, click here to view it online. 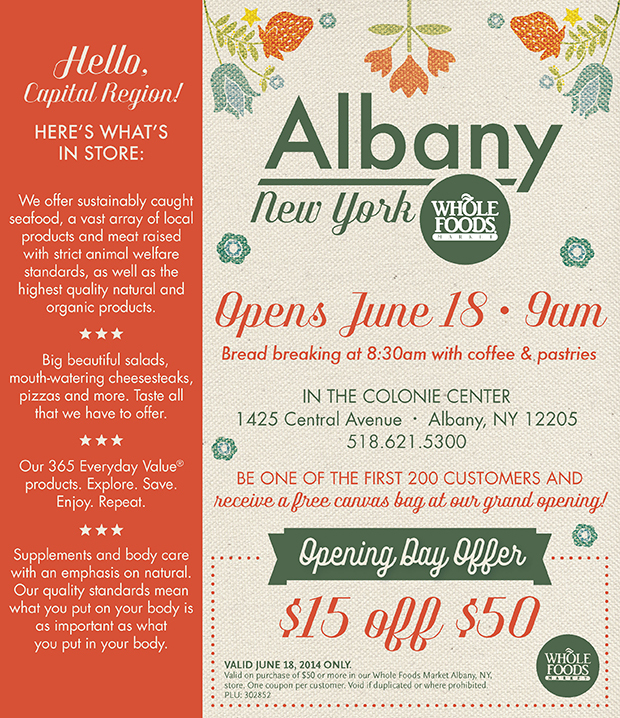 This *HOT* coupon is good for $15 off a $50 purchase at Whole Foods in Albany on opening day (Wednesday, June 18th). You may also show the coupon on your phone, if you don’t want to print it! I would suspect local Price Chopper stores would accept it, too, as a competitor’s coupon. (Reminder: it is only valid for ONE day- June 18). Make sure you click HERE to print it. This entry was posted in Capital Region Deals, Coupon and tagged coupon, Whole Foods Albany. Bookmark the permalink. Pingback: » Whole Foods Shopping Trip- and Finding Deals!